There are a number of different retirement accounts to choose from but assuming you’re not self-employed, you likely have as your main retirement account either a 401(k) or 403(b). First, let’s look at how each plan works. The 401(k) is a retirement plan offered mostly by for-profit companies to assist employees in saving for retirement. Decades ago companies offered their employees a pension but in 1978, Congress passed the Revenue Act of 1978. That’s when Section 401(k) of the tax code was born. By 1983, nearly half of all large companies offered a 401(k) and today, there is more than $4.8 trillion invested into 401(k) plans. A 401(k) is a what is called a Qualified plan in IRS lingo. Your company gets a tax benefit for contributing money to the account on your behalf and you can contribute part of your paycheck to the plan before the IRS taxes the funds. 401(k) and other company-sponsored retirement plans also limit the amount of investing choices you have. Unlike an IRA where you can choose between most types of traditional investing products, a 401(k) may only have 20-25 choices. The big killer of retirement plan balances are fund fees. Depending on the quality of the plan, you may be stuck with less than ideal options from a fee perspective. You’re not going to believe this but from the perspective of the average employee, there are next to no differences between a 401(k) and a 403(b). Generally, non-profits including schools, hospitals, and religious groups offer their employees 403(b) retirement accounts instead of 401(k) although the 401(k) is available to any company regardless of type. Does that mean that for-profit companies can offer a 403(b)? No. You can’t be a for-profit company and offer a 403(b). 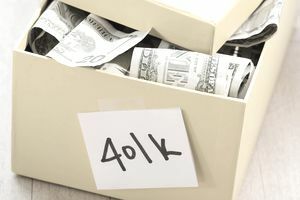 Just like a 401(k), the 403(b) allows you to make tax deferred deposits, have the same contribution limits, and come with all of the same withdrawal rules as the 401(k). One difference that applies to a small subset of employees—if you have 15 years of service and your company is considered a “qualified organization,” you may be eligible to contribute an extra $3,000 to a 401(k). This is not available in a 403(b). Another difference between a 401(k) and a 403(b) is the investment choices. Although most 401(k) plans offer different types of mutual funds as their investing choices, 401(k) plans have the option to offer other choices. 403(b) plans may only offer mutual funds and annuities. Technically, 403(b)s are more limited on investing options than 401(k)s but in practice, there’s not much difference. Finally, because 403(b)s are more limited in the amount of companies they can serve, and non-profits tend to be smaller and have less resources than larger for-profit companies, 403(b)s have gained the reputation of having higher fees than 401(k) but recent trends have seen 403(b) plans emerge with lower fees. There are some other benefits to non-profits that might make a 403(b) more attractive but to the vast majority of employees, the type of plan doesn’t matter. One isn’t better than the other. Instead of evaluating a 403(b) vs. a 401(k), evaluate the investment options inside the plan. Generally, the larger the company, the lower the plan fees because there are more people participating, which brings the costs down. If you work for a small company, you can find lower cost index funds as investment options instead of placing money in the higher-priced actively managed funds. Either way, if your company is matching your deposits, participate in the plan up to the maximum amount they’ll match. After that, open an IRA if the plan’s fees are high. How do you know what “high” means? Most experts say that once you get over 1 percent on any investment choice, that’s cause for concern. Learn more about 401(k) fees here.